We’re always pleased to hear about how our products have helped customers with their renovation projects. However, we were particularly delighted when Roger, sent us these photographs of a poolside deck renovation he recently completed. 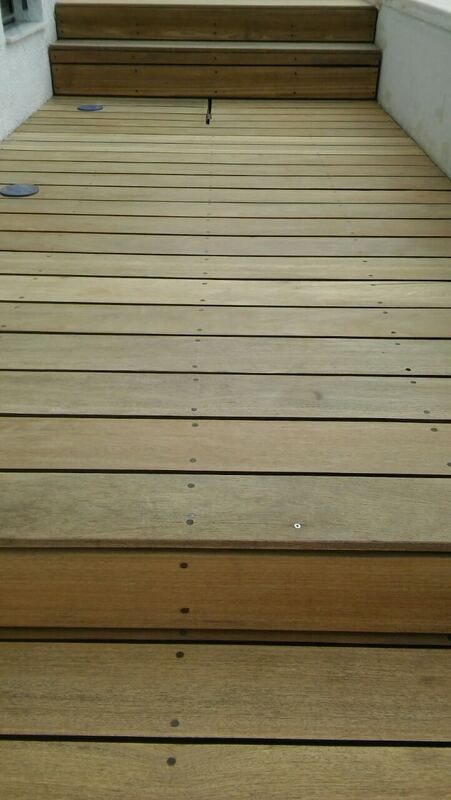 The customer had previously treated their poolside deck with a decking oil, purchased at the hardware store. 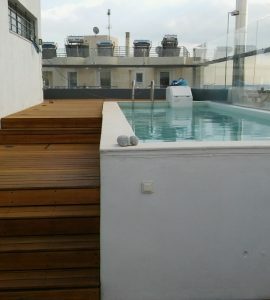 As you can see from the photo, the decking looked dull and tired and was not at all complementing the lovely rooftop views from the pool. We’ve had many customers come to us saying that the hardware store decking oils that they had previously bought had failed and they were continuously having to sand and re-oil their decking to keep it looking smart. By investing in a good quality product, which won’t peel or flake and will protect your wood from within, you could be reducing both the time and money it takes you to constantly strip and re-oil your decking and replacing it with easy, low maintenance decking. Aquadecks, for example, is water-based and is easy to apply and maintain, with no sanding or stripping required. Sometimes, it is worth investing in a more expensive product, such as Aquadecks water-based penetrative wood finish, at the beginning, to save you money in the future. So, how did Roger rescue his customer’s poolside deck? To remove all of the old oil from the surface of the decking, Roger sanded back the decking with an electric sander. 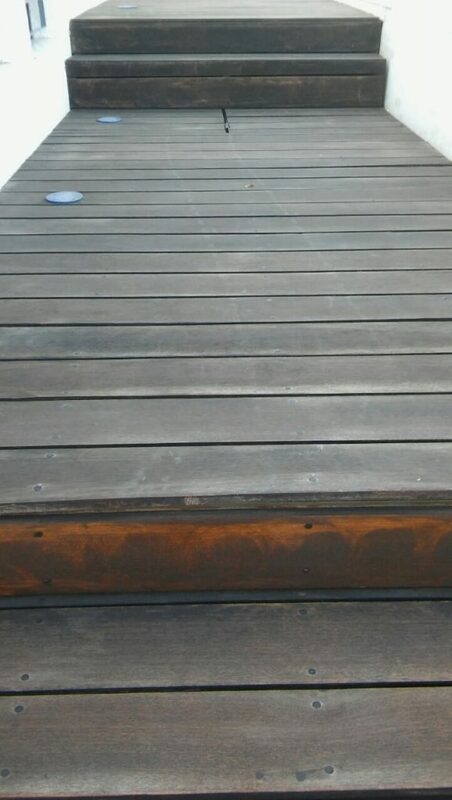 How the decking looked after sanding can be seen in the photo below. Whilst this step is often completed by professionals, for the DIYer it’s going to be easier to remove the old oils using Aquanett wood oil remover (if it’s a different sort of coating you’re removing then use Prepdeck). If you don’t want to sand back your decking, follow the steps below if you’re removing oils. Aquanett can be used to remove teak and other oils from all woods blackened by UV rays. It will prepare your decking for a new coating and improve penetration and adhesion. Its gel-like consistency means that it’s easy to apply. Even better, it’s suitable for environmentally sensitive areas, as it does not contain solvent or paraffin and it’s biodegradable. If you choose to use Aquanett instead of sanding, you’ll then need to neutralize the decking with Net-Trol before applying your finish. 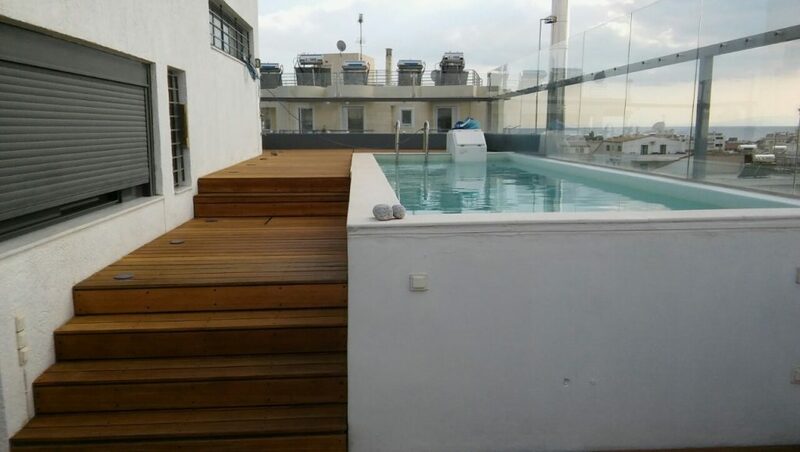 No matter how many times we see photos of decking renovations using Aquadecks water-based penetrative wood finish, we’re always really impressed with how it turns out. First of all, Roger applied a liberal amount of Aquadecks, working in the direction of the grain, in sections that he could complete within 30 minutes. As soon as the ‘wet look’ of the first application had disappeared, Roger then applied a second coat and allowed this to penetrate for 15 minutes. He then removed any excess Aquadecks that hadn’t penetrated the decking, to avoid it drying as shiny spots on the surface. The place for Aquadecks is in the wood, not on the surface. As Aquadecks is water-based, Roger was then able to clean his tools with soap and water. We think that the deck now looks as good as new – if not better! Have you used Aquadecks to rescue your deck? We’d love to see your photos!